Prince Harry and Meghan Markle's royal wedding definitely has the world's eyes on them, us included! The couple had stated the their wedding would be a mix of tradition and personalization, and so today's celebration proved it. 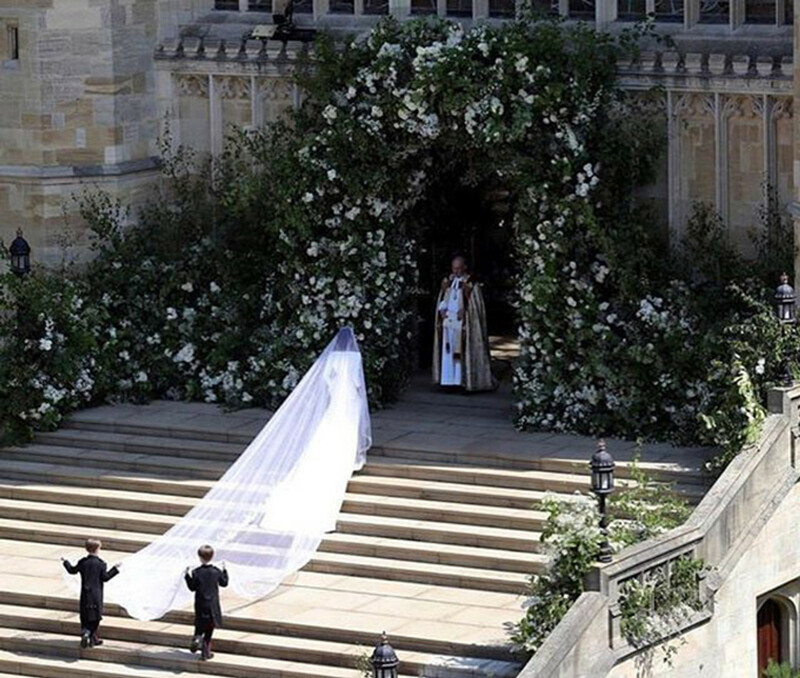 From Meghan Markle's wedding dress to the A-list stars attending the affair, here are a list of our favorite things about the royal wedding. After months of secrecy, the wedding dress was finally revealed. Contrary to popular belief, Meghan chose a French designer line, Givenchy, instead of opting a British design house. Kensington Palace said that the label was chosen by Meghan for its timeless and elegant aesthetic, impeccable tailoring and relaxed demeanor. 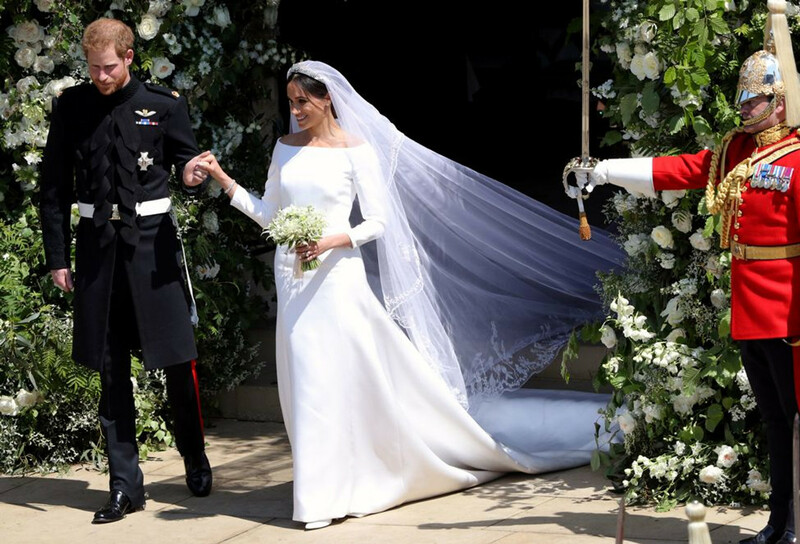 The dress itself was a boat-neck, three-quarter-sleeved white silk creation by Clare Waight Keller, artistic director of Givenchy. 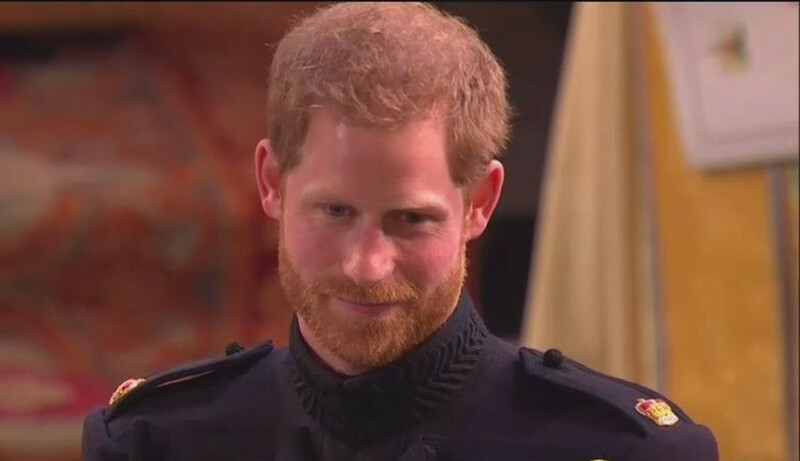 Prince Harry handpicked several flowers present in Meghan Markle's bridal bouquet, from their private garden at Kensington Palace. It includes foget-me-nots, the late Princess Diana's favorite flower, deliberately chosen to honor her memory. The posy also featured scented sweet peas, lily of the valley, astilbe, jasmine, astrantia and sprigs of myrtle, bound with a raw silk ribbon. The tiara on Meghan's head is Queen Mary's diamond bandeau tiara, which was loaned to her by the Queen. The sparkling beauty had 10 brilliant diamonds at its center, holding her five-meter long white silk veil in place. Embroidered on the veil were floral details representing 53 countries of the Commonwealth. Meghan suggested this design as the Commonwealth will be the central part of their official work after they're married. 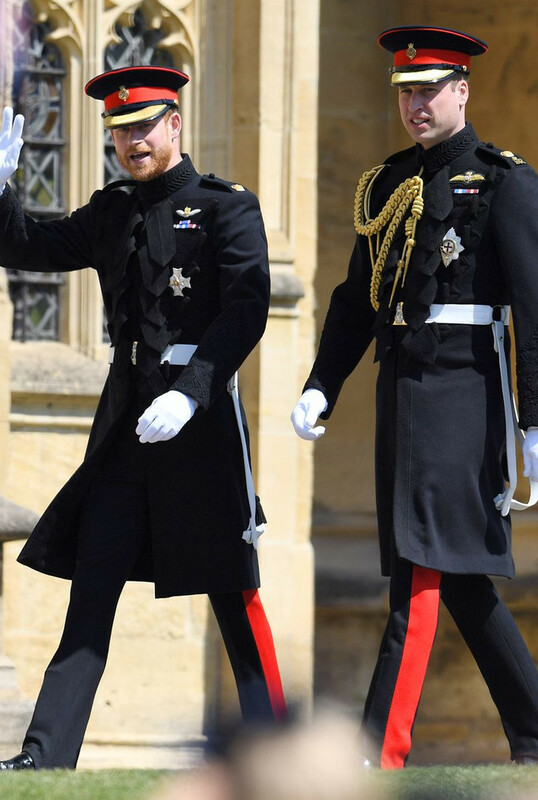 As they enter the wedding venue, Prince Harry was escorted by his brother slash bestman, Prince William. The two brothers were dapperly dressed in their military uniform. 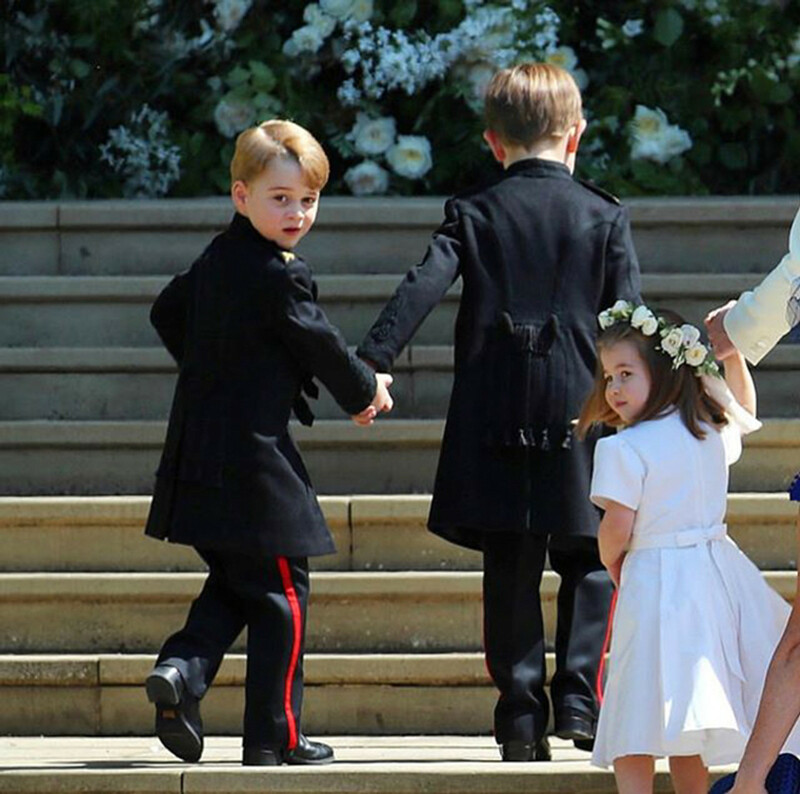 Princess Charlotte and Prince George were also taking part in the royal wedding as flower girl and page boy, along with a group of other tiny participant in the bridal party. Aren't these two just so adorable? We're totally in love with the decoration at St. George's Chapel in Windsor Castle. 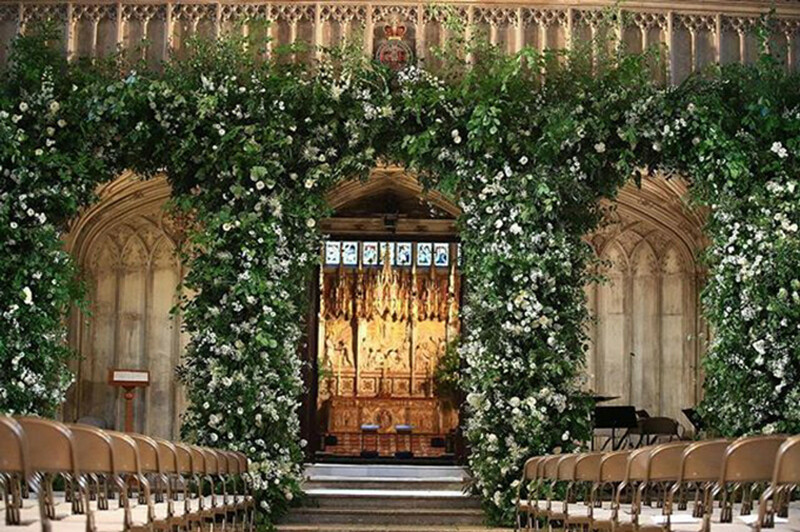 All white arrangement of garden roses, foxgloves, and peonies mixed with greeneries beautifully lined the chapel doors inside and out, creating a fine entrance for the beautiful couple. After the ceremony, these flowers are turned into bouquets and being sent to St. Joseph's Hospice as gifts for the patients. From Oprah Winfrey, The Beckhams, down to the bride's BFF Priyanka Chopra, it seems like everyone was there and with a gorgeous get up as well. We especially love how Amal and George Clooney went matchy-matchy, her in a mustard dress and him in a yellow striped tie. It seems that British royal weddings wouldn't be complete without the presence of fancy fascinators and we are loving each one of them. One however, stood out the most. Kitty Spencer, cousin of the groom, arrived at the scene clad in an emerald green Dolce & Gabbana ensemble, complete with a Philip Treacy headpiece. She looks stunning, as pretty as her late aunt Princess Diana. 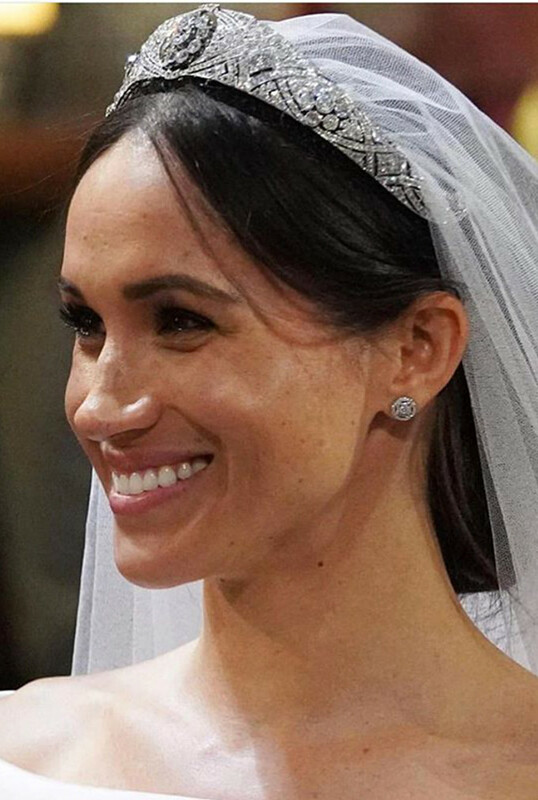 For her most special day, Meghan went with a natural makeup look that effortlessly enhanced her bridal glow. Would you wear your makeup this way on your wedding day? The Prince couldn't hold back tears as Meghan Markle entered the chapel hand in hand with his father, Prince Charles. Originally, Meghan's father was supposed to walk her down the aisle yet the arrangement had to be cancelled as Meghan's father couldn't attend the wedding due to some health issues. After her request, Prince Charles gladly said yes to walking Meghan down the aisle. Kensington Palace said, The Prince of Wales is pleased to be able to welcome Ms. Markle to the royal family in this way. 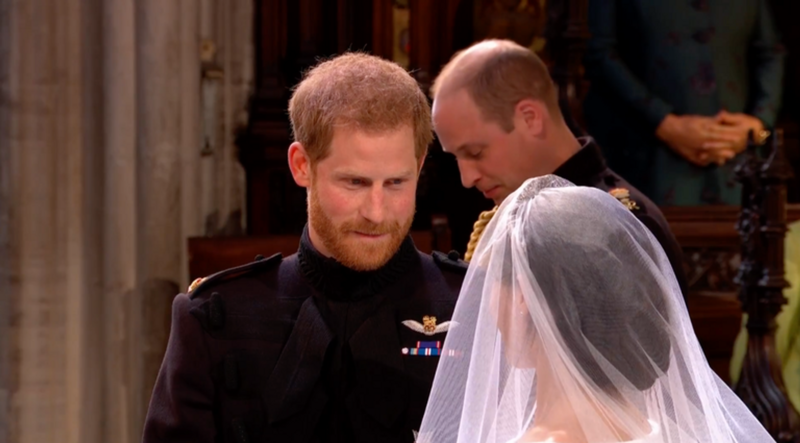 As the two finally stood side by side, Prince Harry whispered to his bride, "You look amazing, I'm so lucky." To which Meghan responded with a bashful smile. 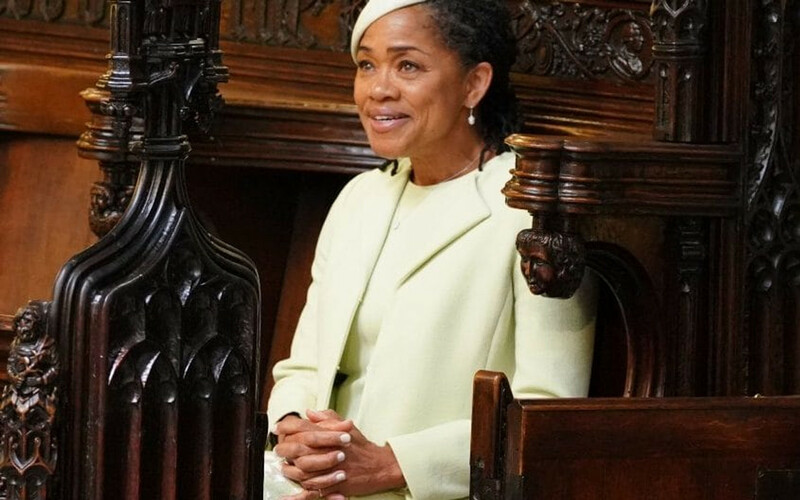 Meghan's mother, Doria Ragland, also couldn't be able to hold back her tears as she witnessed her daughter's marriage. Prior to the ceremony, Doria was also seen with tears welling up in her eyes as she and Meghan arrived together at the wedding venue. 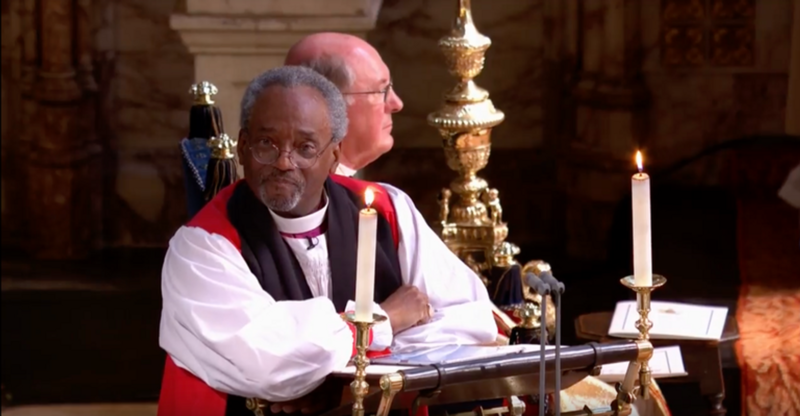 Bishop Michael Curry delivered the sermon at today's royal wedding. 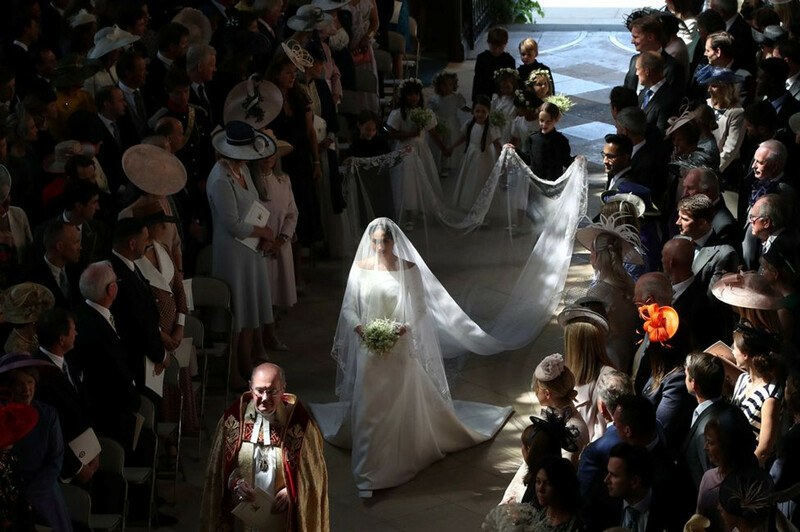 The Episcopal Church bishop delivered a 13-minute speech, imploring the couple and those who were present to put Love at the center of their lives. "We must discover the redemptive power of love. And when we discovered that, we will be able to make this old world a new world," he said. 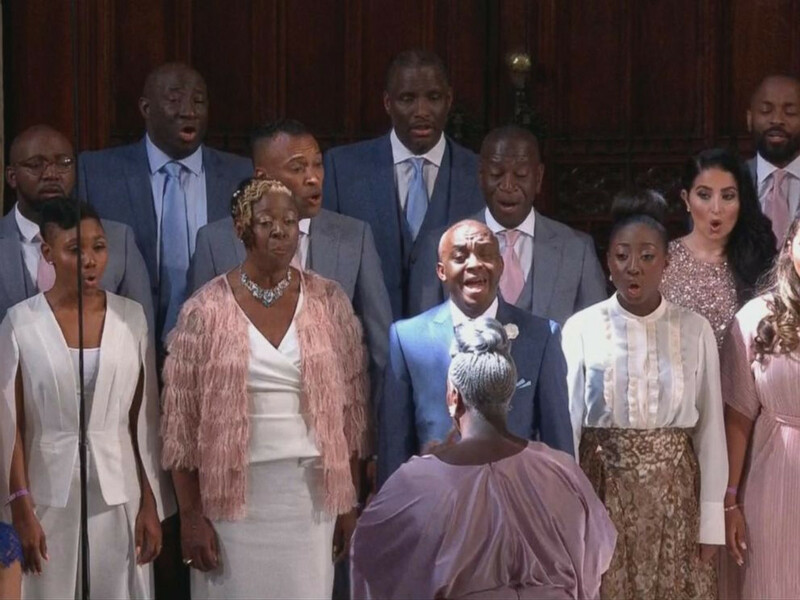 During the ceremony, a gospel choir performed a rendition of the classic wedding song, Stand by Me, which successfully gave the chills to all ears listening. Last but definitely not the least, is the royal wedding kiss. Interestingly, the couple only kissed after they were outside the church, saving the smooch for the chapel exit. Turns out, it isn't tradition for royal couples to kiss in church during their wedding ceremony. 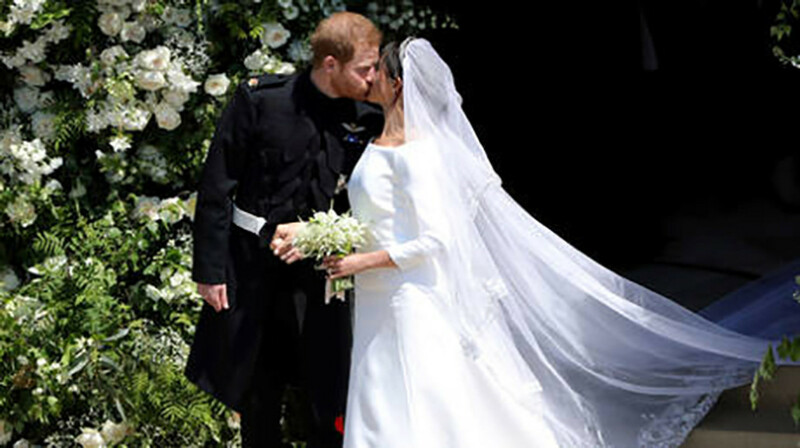 By doing so, The Duke and Duchess of Sussex kept the tradition following the footsteps of Prince William and Kate Middleton as well as the late Princess Diana and Prince Charles. For their wedding reception, held in Frogmore House, the bride changed her wedding gown into a stunning Stella McCartney halter-neck dress. 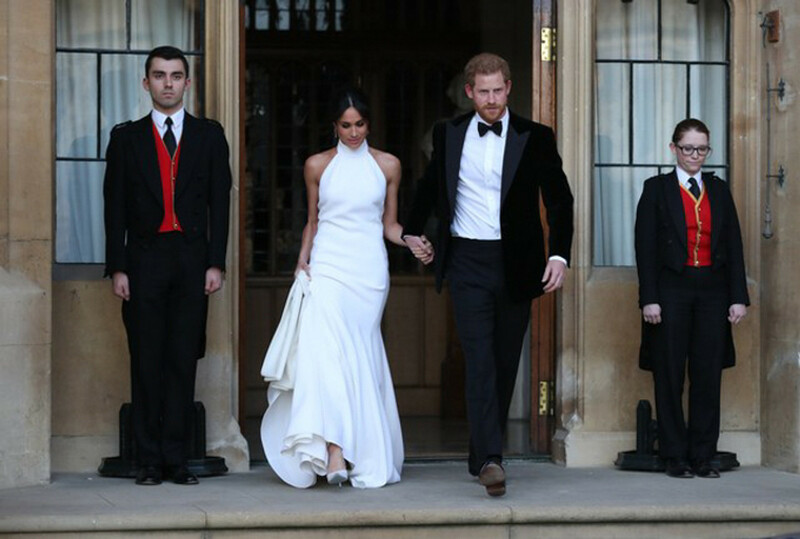 The Kensington Palace representative described the second dress as "Lily white gown with high neck detail in silk crepe". She completed the look with a pair of Aquazurra satin shoes with painted-blue sole. Her other Something Blue? The Jaguar that she rode with her new husband and an aquamarine ring from the late Princess Diana's jewelry collection on her finger. After the beautiful wedding, The Kensington Palace has finally released the newlyweds' official photos. 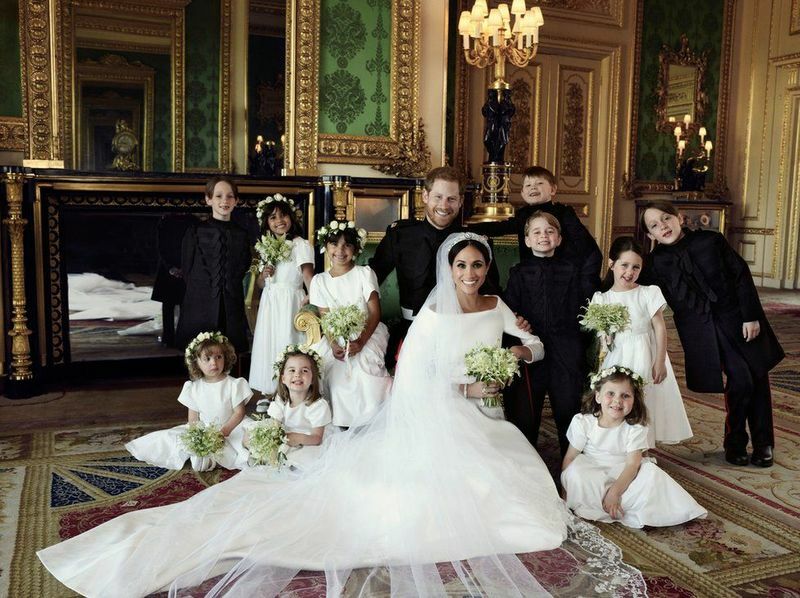 The shots are taken by English photographer Alexi Lubomirksi, who is a former assistant to the late Princess Diana's favorite photographer Mario Testino, immediately after the carriage ride on Saturday. 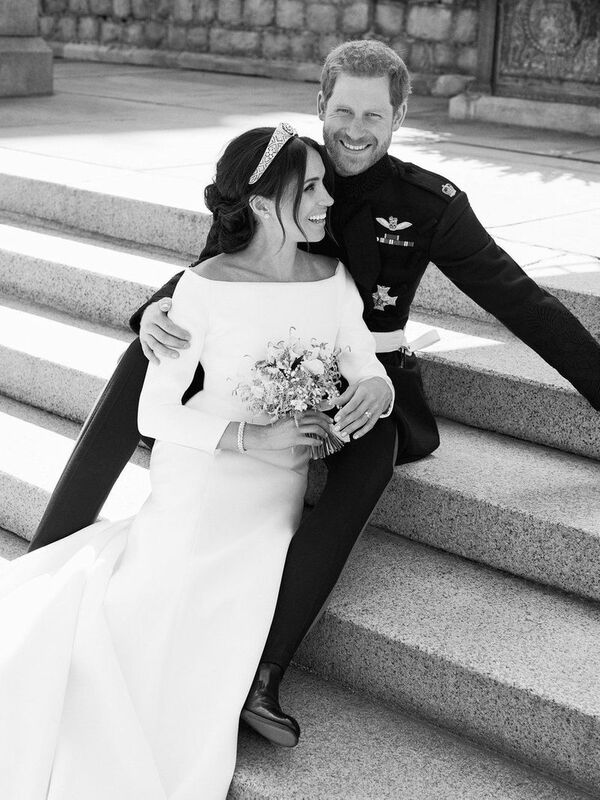 Compared to William and Kate's photos, the Duke and Duchess of Sussex's photos have a more casual and intimate aura about them, somewhat depicting the couple's personality. 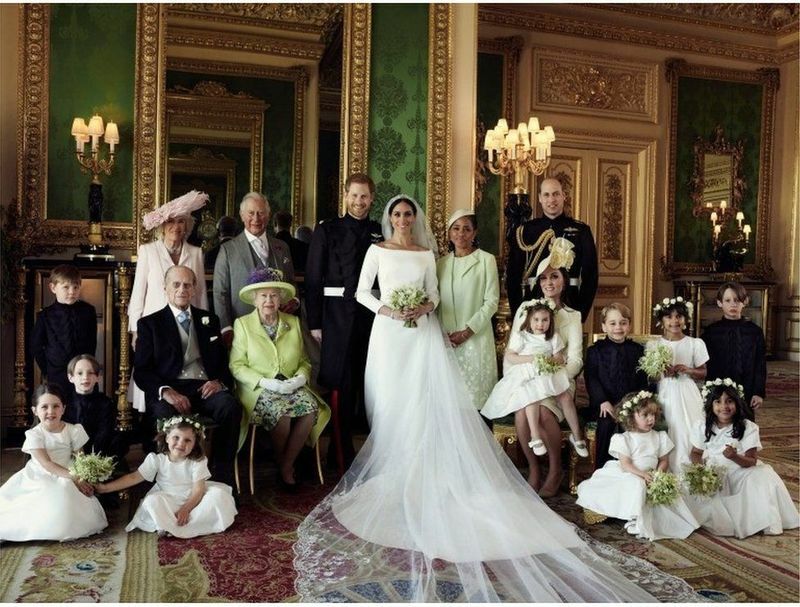 A statement accompanying the photo release said that the Duke and Duchess is delighted with the photos and wanted to say thank you to everyone who took part in their wedding. The statement even further read, "They feel so lucky to have been able to share their day with all those gathered in Windsor and also all those who watched the wedding on television across the UK, Commonwealth, and around the world." There you have it, all the things we love about the royal wedding and the official photos of the new couple. Are there any beautiful moments we've missed? And what do you think about the official wedding shots? Tell us in the comments below!